Why Go to an Orthodontist in Suwanee, Georgia? When you are looking for an orthodontist in Suwanee, Georgia, we know treatment for braces or clear aligners is a huge decision that can affect your dental health and smile for a lifetime. Currently, there seems to be some confusion on who is best suited to provide your orthodontic care – your family general dentist, or a certified orthodontic specialist. We have noticed lately that more and more general dentists have begun to incorporate orthodontic services in their practices. Consumers have the right to be informed of the significant differences in quality of care, education and training between an orthodontist and general dentist, before starting their orthodontic treatment. After all, it is your smile, your bite, your profile, and your choice. When selecting an orthodontist in Suwanee, Georgia, something to keep in mind is that ALL orthodontists are dentists, but only 7% of dentists are orthodontists. “Why is this – I thought all dentists were the same?” However, just as there are medical specialties, such as pediatrics, internal medicine, or dermatology, there are also dental specialties. Becoming an orthodontist require additional advanced training. For example, to become a general dentist, it takes nearly 8,000 hours of basic dental education in dental school to earn a DDS/DMD degree. Additional schooling is required to become a specialist. While basic dental training allows a general dentist to perform routine dental work, such as cleanings, fillings, simple extractions, crowns, bridges, dentures and teeth whitening, a specialist like our orthodontist in Suwanee, Georgia, spends an additional 4,000 to 6,000 hours of specialty orthodontic training in an accredited residency program. It must be emphasized that general dentists get absolutely no specialty orthodontic training in dental school. Today, more and more general dentists are advertising orthodontic care, using “hard-sell” tactics and offering discount coupons to promote such services as Six Month Smiles®, Fast Braces and Invisalign treatment to their patients. This can be confusing to many consumers. Regardless of their motivation to provide orthodontic services, general dentists do have a moral and ethical obligation to provide the best care for each patient. Part of this responsibility is to provide each patient with informed consent, and let their patients know that they are NOT orthodontic specialists, as recognized by the American Dental Association and the Georgia Board of Dentistry. Dr. Walton, our orthodontist in Suwanee, Georgia, hopes that potential patients will take the time to review this video about the inferior quality of orthodontic treatment performed by general dentists. 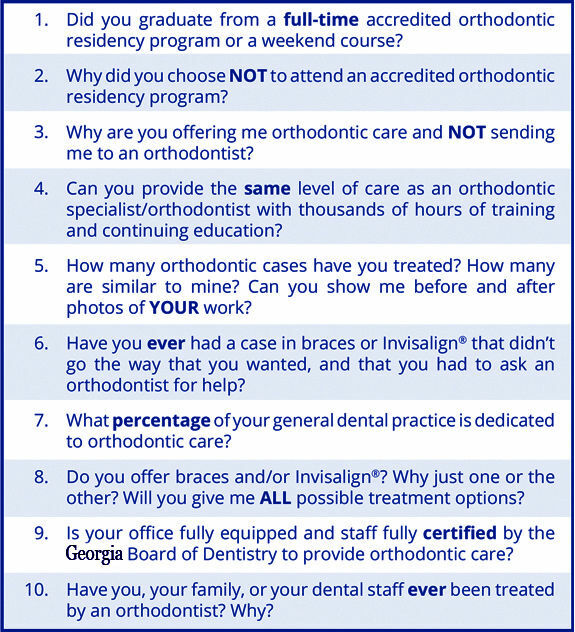 Honest answers to these to these questions will make it very obvious that an orthodontist in Suwanee, Georgia, is the overwhelming choice for braces and Invisalign.